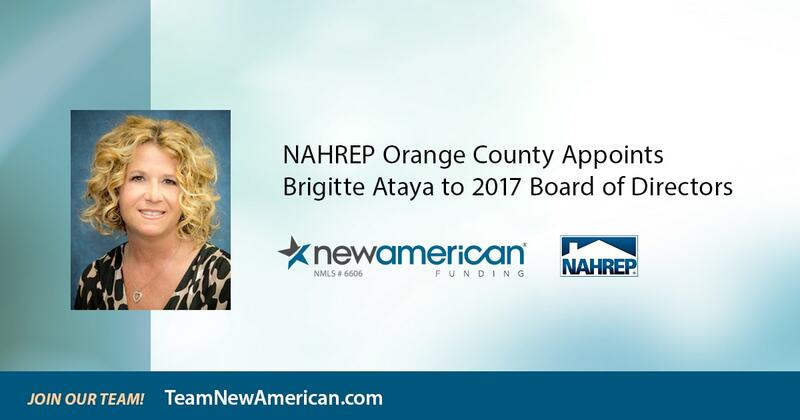 New American Funding announced today its SVP Regional Manager, Brigitte Ataya, has been named to the Board of Directors for the Orange County Chapter of the National Association of Hispanic Real Estate Professionals (NAHREP). Ataya will serve a 1-year term as Events Director for the organization, coordinating various educational, networking, and business development opportunities for members. NAHREP is the leading national advocate on housing policies that affect Hispanic homebuyers and the OC Chapter works to empower local real estate professionals who serve homeowners in the region. "I'm honored to stand with NAHREP as one voice to advance sustainable homeownership for more Hispanics," said Ataya. "We have a common vision of reaching the underserved. Therefore, it's a tremendous privilege to be a part of the excellent work the organization is doing in making a difference in our community." Ataya joined New American Funding in 2010 and has nearly 25 years of experience in mortgage banking, which she continues leveraging in order to progress the industry. She maintains an active advocacy role on a local and national level by sitting on the Advisory Board for the OC Chapter of the Asian Real Estate Association of America (AREAA) and she serves as an at-large member of the Mortgage Action Alliance (MAA) Steering Committee. Ataya is also impacting the next generation of leaders by mentoring youth through Big Brothers Big Sisters of Orange County. "We love seeing our people step into leadership roles that empower and equip people in such a way that avenues are created for more Americans to become homeowners," said Patty Arvielo, Co-Founder and President of New American Funding. "We need proud champions like Brigitte serving our community for the greater good and making a positive impact." NAHREP OC has several events planned for 2017 with an upcoming Installation Gala on February 24.